Free shipping. Buy direct from HP. See customer reviews and comparisons for the HP 940 Black and Yellow Original Printhead. Upgrades and savings on select products. Print business-quality black documents and vibrant color with consistent quality throughout the life of your printer. 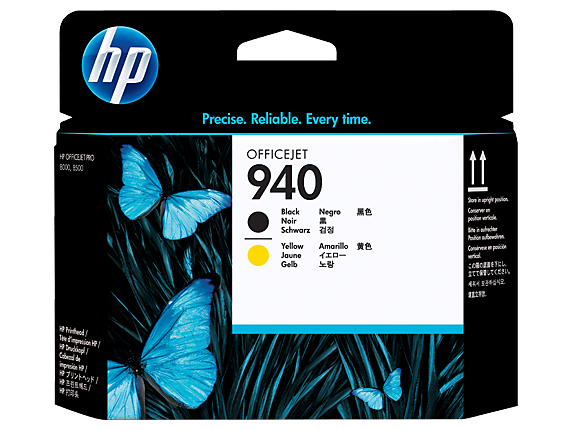 HP 940 printheads work exclusively with HP 940 ink cartridges to ensure reliable, consistent output. HP printheads are designed for reliable performance throughout the life of the printer.HP is a leader in service and support, providing a warranty for reliability you can count on. HP 940 printheads work exclusively with HP 940 ink cartridges.Avoid downtime and enjoy sustained productivity with legendary HP quality and reliability. HP 940 printheads feature more nozzles, enabling faster speed and sharper print quality.Innovative HP Smart printing technology optimizes print quality to deliver the best possible output.